Multi-pin circular connectors with removable contacts have been a standard in both military and commercial aviation since the 1940's. MIL-C-5015 connectors were first developed for the interconnection of communications and avionic equipment in WWII fighter and bomber aircraft. 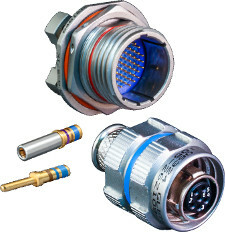 Today, a broad range of cylindrical connector types — many specialized for land, sea, air and space applications — are used for the interconnecton of electronic systems, sensors, power supplies and other equipment that depend on reliable performance and standards-body guarantees for performance and quality. From satellites to ruggedized shipboard and industrial applications, Glenair supplies literally every power, signal, or high-speed cylindrical connector configuration. From our QPL'd MIL-DTL-38999 hermetic, environmental class, and G class Space-Grade MIL-DTL-38999 solutions to the revolutionary Series 970 PowerTrip™, Glenair leads the industry in the design and development of high-performance, mission-critical military/aerospace connectors. Glenair has been a qualified supplier of MIL-DTL-38999 solutions for over a decade. All our Mil-Aero connector technologies are 100% Made in America, with zero material, component part or labor sourced in China, Mexico or other off-shore environments. We offer the complete range of solutions including MIL-DTL-38999 Hermetic, EMI/RFI filter, High-Speed, Printed Circuit Board, Environmental Class, Space-Grade and more. This page provides links to many of the most popular Mil-Aero cylindrical connector series, including our revolutionary SuperNine® High-Performance MIL-DTL-38999, our DLA and Maritime qualified MIL-DTL-38999 Series III, plus links to Glenair MIL-DTL-28840 navy connectors SAE / AS81703 Series 3 Type Connectors and more. Hermetics, Filters, Environmentals, Feed-Thrus, Lanyards, Sav-Cons® and More!